My local public library is doing a great promotion right now that encourages participants to read books either published or set in different decades within the last 100 years. Normally that's the kind of challenge I might shy away from—I gravitate strongly toward contemporary books, and my to-read list is mostly full of books written within the past few years. What can I say, I'm a creature of the moment. Then I found out the finisher's prize is a tote bag, and I immediately started hunting for books that would fit the bill. Because (and I'm not ashamed to say this) I would do a lot of things for a free tote bag with a book-related logo on it. 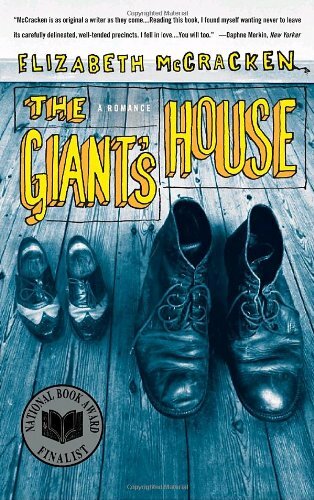 I chose The Giant's House because it was first published in 1996 and the story is set in the 1950s, giving me a couple options for how to record it on my entry form. And it turned out to be a win-win, because not only did it get me one step closer to a tote bag, it was also a good-if-a-bit-weird read. Dour, slightly misanthropic Peggy is a small-town librarian who at twenty-six has already given up on love. It's hard to be too surprised by this, because her crotchety narration makes it clear that she's not exactly Miss Congeniality. She became a librarian because she loves order and knowledge, but most workdays finds herself silently stamping books and filing cards behind the desk, unappreciated and unacknowledged. Then one day eleven-year-old James comes to the library, and everything changes for Peggy. James is literally a giant—he's already over six feet tall and will continue to grow for the rest of his life. He's also a sensitive soul and a voracious reader, and Peggy goes out of her way to supply her fascinating patron with a wide variety of books. Over the years, Peggy does whatever she can to stay in James's orbit, despite his mounting physical problems and her own solitary nature. And now, if you'll excuse me, I'm off to claim myself a tote bag.